A manhunt was underway Friday for a shooter or shooters who opened fire at a shopping mall in Munich, killing and wounding several people, a Munich police spokeswoman said. The city transit system shut down and police asked people to avoid public places. Police said witnesses reported seeing three different people with guns near the Olympia Einkaufszentrum mall. Munich police spokeswoman Claudia Kuenzel told The Associated Press there were “several dead and wounded” in the shooting. She could not provide exact numbers. The Bavarian Interior Ministry confirmed at least one dead and multiple people hurt. Public broadcaster Bayrischer Rundfunk reported that shops in the center of Munich had closed with customers inside. 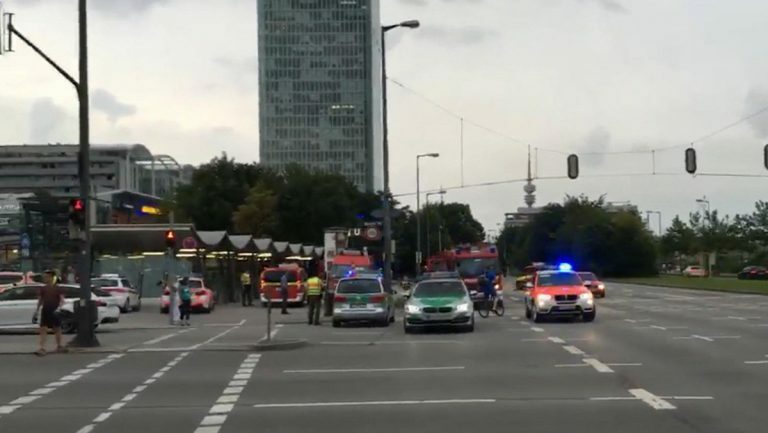 Police responded in large numbers to the mall in the northern part of Munich, not far from the city’s Olympic Stadium in the Moosach district of the Bavarian capital. It’s the second attack in Germany in less than a week. On Monday, a 17-year-old Afghan wounded four people in an ax-and-knife attack on a regional train near the Bavarian city of Wuerzburg, and another woman outside as he fled. All survived, although one man from the train remains in life-threatening condition. The attacker was shot and killed by police.